Okay… So…Well… See… Okay, I am really struggling here to write something, anything that will convey how unexpectedly phenomenal A Curious Tale of the In-Between by Lauren DeStefano is without giving anything away. Pragmatic Bellamy, Pram, is special—she can talk to ghosts. She doesn’t have too many friends amongst the living, but that’s all right because Felix, a ghost, and her are the best of friends and who needs to hang out with living people anyway? I honestly did not expect much from this and was really hesitant to even read this. But it is coming out soon, September 1st and I figured that if I didn’t like it after a few chapters, I could move onto something else. Well, those few chapters turned into me not being able to put this down and basically ploughing through this in a matter of hours. This is a story about friendship, about fitting in, about family and about protecting the ones you love. There are so many wonderful layers to A Curious Tale of the In-Between. While this is a middle school book, I think that older teens would also like this, especially hi/lo readers. The language is middle school appropriate but the story is phenomenal. I’m not even sure if phenomenal is a strong enough word. This is a richly developed story even though it moves pretty quickly. The way in which DeStefano brings everything together in the end is mind blowingly awesome. If you are looking for a fun, thought provoking read, THIS is the book for you. Actually, forget that. If you are looking for a book, regardless of genre or reading level, this is the book for you. 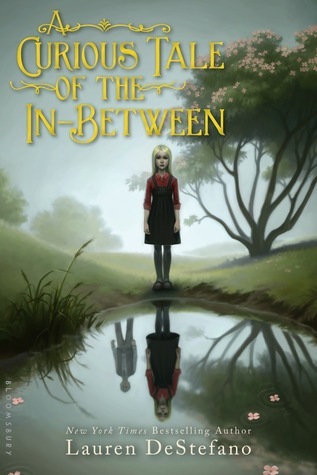 A Curious Tale of the In-Between comes out September 1, 2015. This entry was posted in Ghost, Middle Grade, Young Adult and tagged A Curious Tale of the In-Between, Ghost, Lauren DeStefano, Middle grade reader, Young Adult. Bookmark the permalink.